Integrity, honesty and professional service are the three main pillars which have served as the founding philosophy of Coldwell Banker Real Estate LLC for the last 113 years. Now one of the biggest real estate companies across the globe, the American franchise came to life following the 1906 earthquake which tragically affected the San Francisco area. The devastation caused by the natural disaster left the real estate market in disarray, with many opportunistic agents taking advantage of the commotion and the circumstances to make a quick buck. A then young businessman, Colbert Coldwell, was greatly affected by the ruins and exploitation which surrounded the city. Knowing local businesses, landlords and families would require new property, Mr Coldwell established his own real estate firm only four months after the catastrophe, vowing to conduct business with integrity, honesty and in the client’s best interest above all. In 1913, Mr Coldwell was joined by Benjamin Arthur Banker, another real estate professional who shared similar values, only to become a partner just a year later. 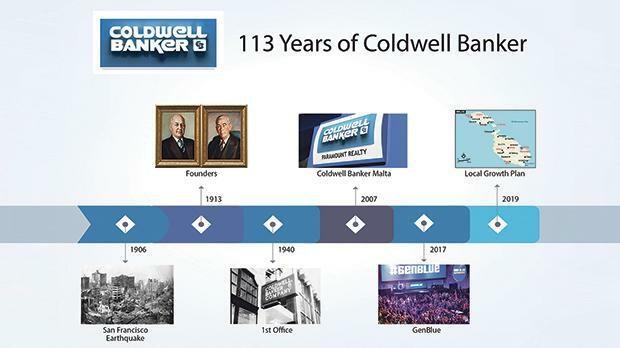 It was through their founding principles that Coldwell Banker began to become increasingly popular with the local population, leading the pair to expand to a bigger office in San Francisco while also expanding to the surrounding states. Twenty-seven years after the pair met, the company officially changed its name to the now easily recognised Coldwell Banker & Co., solidifying their partnership in the history of real estate. Unfortunately, it was only after the passing of these founders that their dream of establishing offices from the West coast to the East coast of America was recognised, and surpassed by the fact that the company opened its first international branch in 1996, proving how far the pair’s life’s work had come. The attributes of progress, innovation and development left by the founding pair are still engraved in the company’s ideology, leading the later generations of managers to adopt a more modern logo, develop one of the first real estate websites in the world, engage with their audience on You Tube and offer a mobile-friendly platform for their clients. Over its 100 years in operation, the new generation of Coldwell Banker agents have never forgotten their historic focus on giving back to the community. As they celebrated their anniversary in 2006, the American company helped to raise over $5 million to support the ‘Habitat for Humanity’ charity project. With the American global franchise keen to continue enhancing its international presence it isn’t surprising that the agents in blue found themselves on the Maltese doorsteps. In 2007 the first Coldwell Banker branch in Malta opened its doors and began providing its professional services to the Maltese public. The brand has developed a strong relationship with the locals aided by the international backing Coldwell Banker Real Estate LLC guarantees all franchisees. Both local and international agents of the brand are constantly encouraged to attend various meetings, training and conferences, to hone their skills, meet up with other peers and establish connections all over the world. Coldwell Banker plays host to one of the largest gatherings for its real estate professionals all over the globe through its GenBlue Experience, considered to be the epicentre of the real estate world. In the upcoming years Coldwell Banker Malta hopes to follow in the legendary footsteps left by its founders, with expansion plans to open up new branches around the island. For more information about Coldwell Banker Malta call (+356) 2339 2339, send an e-mail on info@coldwellbanker.mt or visit www.coldwellbanker.mt. Coldwell Banker Malta is a real estate services business unit within Famalco/Building Business.